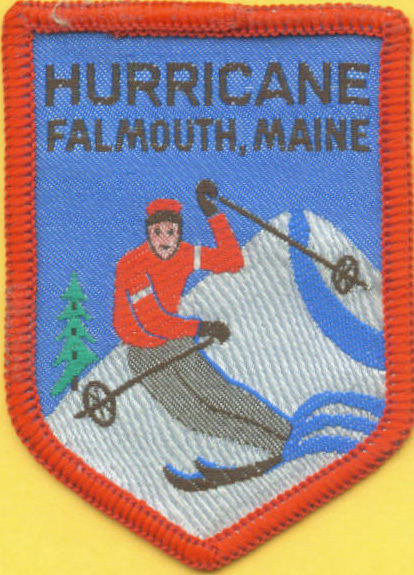 Hurricane Ski Slope in Falmouth opened around 1946 in Falmouth Maine. Night skiing and a rope tow served this small slope. Increased insurance rates closed the mountain around 1973, or shortly thereafter. I am Charlene Manchester now Barton. My Dad started Hurricane Ski Slope with Al Ervin. I was in the second grade, I remember, when I used to go skiing there with him. He and Al did almost everything--cranked the rope tow motor up to get it going, directed traffic, and were the ski patrol. As was noted in your report, accommodations were across road at the Norton farm where we could go to use the rest room or get a cup of hot chocolate and a hamburger. Summers I would go with him and Al to the hill and play while they cleared brush and tried to improve the hill, even opened one small trail to the right of the main slope. I was in the 5th grade when I tore a ligament in my knee skiing there. Naturally, the ski patrol quickly appeared and my Dad carried me down the slope in his arms. I was in contact with Glenn Parkinson who came to interview my mother , who at 96 is a very good source of information although actually, she was not much of a skier. The time I am referring to must have been around 1945 because I clearly recall discussing skiing with my second grade teacher Miss Booth, who skied at Hurricane. This was at DW Lunt School in Falmouth where I grew up. I was in the 5th grade when I hurt my leg. My Dad, Charles Manchester , was one of the first skiers in the State, beginning on barrel staves in North Gorham where he grew up. He was a racer and skied the White Mountains . We have a picture of him at Tuckerman's when not many souls ventured up there to ski in the spring. As I understand it, the shortage of gas during WWII was a motivator as he had a passion for the sport, but no gas to get to the mountains in N.H. Two of his best ski buddies were Al Ervin, who started Hurricane with him, and Homer Haywood, who was in the ski troopers during WWII, I think. Another ski pal was Chase Thompson. These guys worked to ski--hiking up Cranmore when the lifts were closed due to the gas shortage caused by WWII. It finally got to be too much for my Dad to run Hurricane, as he was spending more time directing traffic for parking than skiing, which after all was why he and Al started the project. I think my Dad and his ski buddies should be remembered for their love of the sport and their willingness to do whatever it took to ski. Also, they were perfect gentlemen, wonderful manners on the slope, graceful and handsomely dressed, often in neckties. Those were the good old days! Jeff Ryan: I remember Hurricane Hill in Falmouth fondly, as it was the first place I skied. The year was 1962. My parents loaded us into the station wagon and drove the 6 miles or so to the hill. The barn across the street (Blackstrap Rd.) from the rope tow had a wood stove and a modest snack bar. The rope tow was notorious for ripping through the palms of mittens. Subsequently, my parents obtained a hand-me-down "rope tow belt". It consisted of a belt that went around my waist tethered to a metal piece with jaws that clamped over the rope tow. By holding on with two hands, you could zip up the tow with no problem. The hill is still remarkably open and undeveloped. I drive by every year or so check out the hill and the barn which both contain so many memories. Peter Provenchar: Growing up in Portland, I learned to ski at Hurricane in 1964. The area was located on the Blackstrap road in Falmouth. It cost $1.00 per day. They had an old sno-cat with a rolled up section of snowfence to pack the snow which came often in the mid sixties - good snow years. 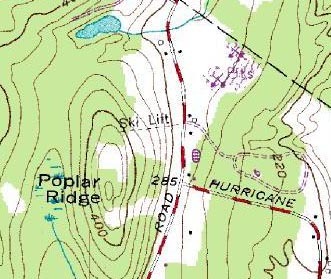 Sometime in the mid sixties a shorter tow rope was installed just north of the Main Hill, it was actually a separate operation called Poplar Ridge, just for beginners. The Hurricane owners also raced sulky horses. The warming hut was in the barn (across the road from the skiing) where you could get hot dogs, burgers, hot chocolate etc right next to the horses. The cool skiers had a belt around their waist with a metal clip to hook to the tow rope, saved gloves and arms. The main slope had a pretty good pitch, there were 3 trails on the south side of the tow but these were seldom used because the brush was not often cut so they needed lots of snow. Bill Stevens: As a kid I learned to ski at Hurricane Ski Slope, somewhere near Portland, likely in Windham it had a rope tow and no facilities. I think in emergencies the toilets in the farm across the road may have been available. Jack Loveland, a child of about 10- 12 was pulled through the top gate into the drive pulleys of the rope tow and broke a great number of bones. It was about 1948 - 1952. I skied there from about 1946 to 1954. W.H. Richards IV: As of 1973, Hurricane Ski Slopes was still open. It had a 20-meter ski jump built by the Marines and a private contractor, a rope toe to service the hill, and 6.5 kilometer cross country ski course. The area was operated by the Norton Family and was used by local ski teams to train. My father oversaw the project as he was the coach of the Yarmouth High School Ski Team at the time. Here is the Terraserver image of Hurricane Hill. James Vicenzi: About a dozen years ago I was trying to learn to telemark ski and was looking for a local spot to practice. After hearing about Hurricane Mountain, a friend and I headed to the "Norton Farm" in Falmouth. We approached the owners with a gift bottle of non-alcoholic sparkling wine and asked permission to use the hill. They said they were delighted to have us there. The conditions were ideal (about 8" of fluff on top of ice) and we had a great time yo-yoing up and down the "mountain" until we were beat. The lure of bigger mountains kept us from going back. Hurricane Ski Slope opens with a rope tow. Hurricane Slope has a 900 foot rope tow. Hurricane Ski Slope closes due to insurance reasons. Chris Bradford and Betsy McDonough visited Hurricane Hill in November of 2001. 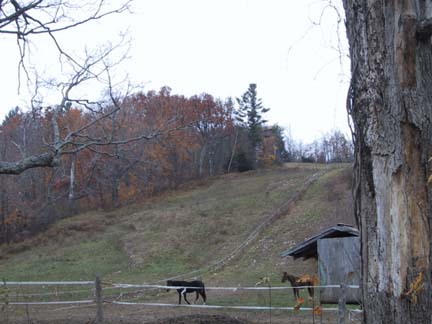 The hill is now used to graze horses. The lights still remain mounted to trees along the side of the trail. Thanks Chris and Betsy for the following photo! Here is a photo of the slope. The lights remain on the trees to the left of the slope.